finding pesky insects inside and outside your home? Call Barnes Wildlife Control’s Insect Removal Services Today! For expert, long-term insect removal services in Greater Dayton Ohio, Call Barnes Wildlife Control (937) 340-1867 Today. 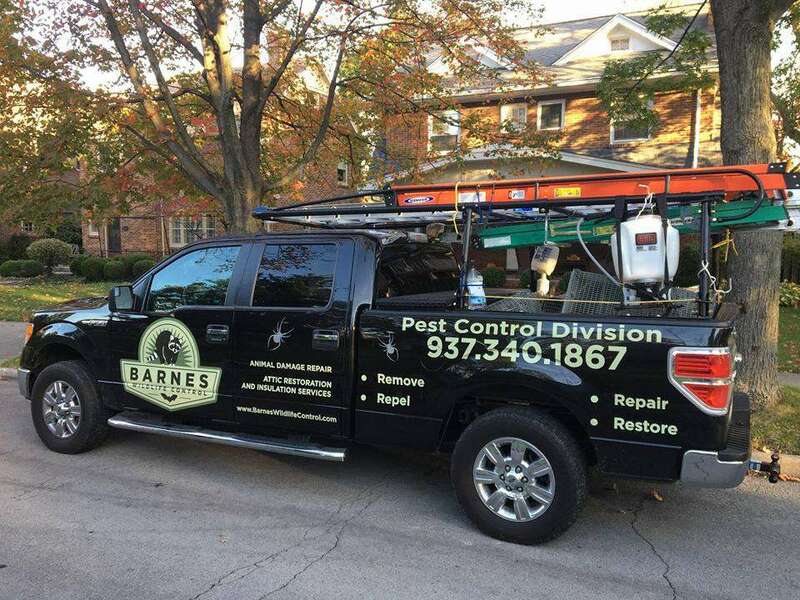 Barnes Wildlife Control’s Pest Control Division reminds you about our Insect Removal Services In Greater Dayton Ohio. The Best Insect Removal Services In Greater Dayton Ohio. So, you can probably handle insects outside you home but once they enter your home you want them out fast and permanently. Fortunately, Barnes Wildlife Control’s Greater Dayton Ohio Insect Removal Services solve insect infestation using environmentally safe industry proven products. Plus, we have tricks we’ve learned over the years that others with less experience won’t have. Additionally, if you can’t seem to remove an indoor or outdoor insect problem using over the counter products please consider hiring the insect professionals at Barnes Wildlife Control’s serving Greater Dayton Ohio. Be Careful With Insecticides: Exposure Means Increased Risk Of Certain Cancers! Barnes Wildlife Control believes in science! And science has shown that children exposed to certain pesticides in their home have an increased risk of types of cancers. Our Greater Dayton Ohio Insect Removal Services makes sure that the insecticides we use inside your home will not expose you or your children to such risks. ALSO, OUR SAFETY AND YOUR SAFETY IS NUMBER 1 FOR US! You want a certified Insect Removal Services professional handling all the products that are used to drive insects out of your home, if not killing them. So please, DO NOT use any dangerous over the counter products in your home! Leave it to the insect experts at Barnes Wildlife Control. 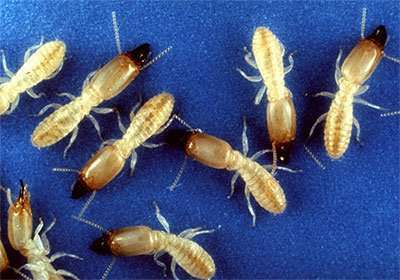 The main destructive termite species in Ohio is the Eastern subterranean termite. Eastern subterranean termites are highly destructive to douglas fir and other common building timbers. Barnes Wildlife Control Insect Removal Services professionally remove termites – GUARANTEED! Have pest Bugs In Your Home? You Don’t Want That Problem! Need Year-Round Insect Removal Services? Barnes Wildlife Control Is Greater Dayton Ohio’s #1 Insect Removal Service. Call (937) 340-1867 Today For Our Insect Removal Services! What Insects Will Barnes Wildlife Control’s Greater Dayton Ohio Insect Removal Services Deal With? Ohh, yes, those annoying pest bugs crawling and flying around you can be a nightmare. 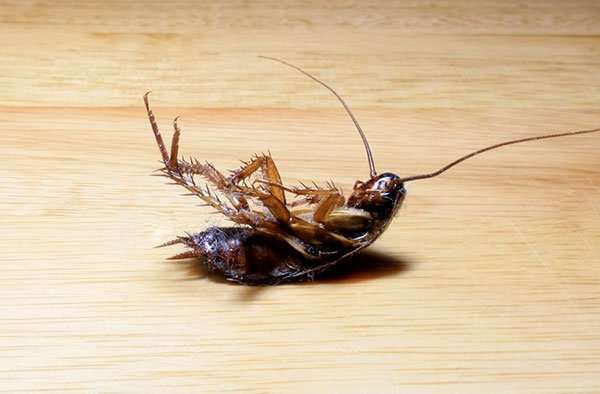 But the horror show is over because Barnes Wildlife Control’s Greater Dayton Ohio Insect Removal Services deal with all types of creepy crawling or flying pest bugs. Given our site remake some of the above pages are still under construction. We kindly ask for your patience. The German cockroach is no match for Barnes Wildlife Control’s Insect Removal Service. We are insect experts and will take care of this problem quickly! Safety is Barnes Wildlife Control’s Greater Dayton Ohio Insect Removal Services number one concern. We will make sure to keep pets and children away from areas where pesticides have been applied. After preventive steps have been taken, we often use baits as a first line of chemical defense against insects or rodents. These are often effective and can be used with low risk of exposure to the pesticide, as long as they are kept out of the reach of children and pets, which we make sure happens. Other relatively low-risk pesticides are available for some pests. We explain what pesticides are suitable for your problem area. Pesticides not contained in baits or traps will generally be applied to targeted locations, not sprayed over the whole room. We use fogging devices only when absolutely necessary. Greater Dayton Ohio Insect Removal Services always read and follow the pesticide label’s instructions and safety warnings, and explain those pesticides to you. We generally use ready-to-use products (i.e., no mixing needed) whenever possible. If you hire us to help control pests, we find the correct the source of the problem before applying pesticides. For example, we might suggest you repair a leaky toilet to remove a water source. Or, we will suggest you use baits and crack and crevice treatments when feasible. 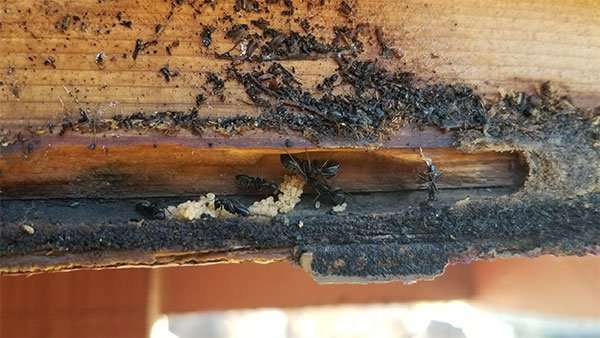 These Carpenter Ants tore up a home of one of our clients. We got in there and exterminated the ants and did some major repairs. Another job well-done by Barnes Insect Removal Services of Greater Dayton Ohio. The label we use list where the chemical may be used. We always have the EPA registration number of any chemical that we use, and we provide to you. We provide full disclosure information about the chemical, such as the material safety data sheet. Insects In Your Home? Insects Biting You? Are Insects Infesting Your Yard? Contact Barnes Wildlife Control’s Insect Removal Services Now!